A bag of frozen vegetables makes a simple side dish, but choosing the wrong cooking method can significantly reduce the nutrients in your vegetables. The heat and water used in cooking alters the vitamin and mineral content of frozen vegetables, but you can take steps to limit nutrient loss and enjoy all the benefits these healthy foods have to offer. Vegetables contain B-complex vitamins that fuel metabolism and vitamin C, a vital antioxidant. These water-soluble vitamins are heat-sensitive, and cooking can destroy them or cause them to leach out into the cooking water. Cooking also affects the mineral content of frozen vegetables. A study published in 1990 by the “Journal of Nutritional Science and Vitaminology” discovered that cooked foods retain only 60 to 70 percent of their original mineral content, and fruits and vegetables have a particularly high rate of mineral loss from cooking. Limit your loss of water-soluble vitamins by steaming vegetables instead of boiling them. Steamed vegetables do not come in direct contact with boiling water, a method that may also prevent the loss of other beneficial substances in vegetables. A 2009 study in the “Journal of Zhejiang University” studied the effects of different cooking methods on the glucosinolates in broccoli. Glucosinolates occur naturally in vegetables of the cabbage family, and preliminary research suggests they have natural anti-cancer properties. The study found that steaming retained higher levels of glucosinolates in broccoli than boiling, stir-frying and microwaving. Boiling and stir-frying caused the highest loss of glucosinolates. High heat and long cooking times lower the nutrient content of foods, so cook your frozen vegetables using the lowest possible heat setting. According to the University of Minnesota Extension, food manufacturers blanch vegetables before freezing, a process that requires quick boiling and cooling to preserve color and texture. 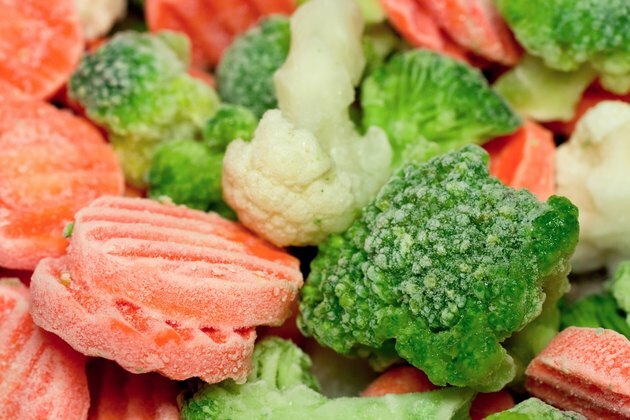 Since blanching partially cooks vegetables, you can safely cook frozen vegetables for less time than fresh vegetables. Penn State Extension recommends cooking vegetables until they have a slightly crisp but tender texture. Cooking food in a small amount of liquid, also called braising, can help to retain the nutrient content of your vegetables. A study published in 2007 in the “Journal of Hygiene Research” studied the effects of steaming, boiling, deep-fat frying and braising on the vitamin and mineral content of potatoes. Boiling and deep-fat frying caused the greatest loss of B vitamins, and boiling yielded the highest mineral loss. Braising retained the highest levels of vitamin C of all cooking methods. If you are in a hurry, microwaving vegetables is another quick, convenient and healthy option. Harvard Medical School claims that the fast cooking times of microwaves help to retain nutrients in vegetables. Columbia Health: Cooking Veggies and Vitamin Loss? Do Vegetables Lose Their Nutrients When Boiled? Do Microwave Ovens Destroy Food Nutrients?